Here is a dish that is simple in concept, flavors, and it is really all about execution. Potato in a cheesy sauce is nothing new; but you can add a little twist but putting the fondue in the a isi canister and foaming it to add texture and air. The result is the fondue has a wonderful light and airey mouth feel to it undestead of a heavy cheesy gut bomb. The potatoes I roasted with hay and garlic to give a bit of smokey earthy flavor. 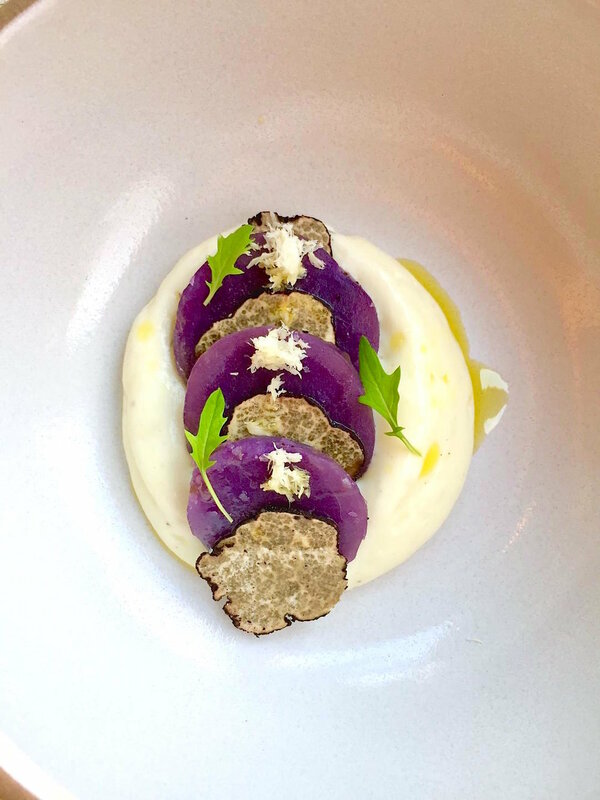 Black truffles never hurt to have and little fresh horseradish rounded of the dish. Simple but delicious that's what great cuisine is all about. Here is the recipe I hope you enjoy it! Preheat oven at 350 degrees. In a roasting pan lay hay down in the bottom of the pan. Drizzle potatoes with olive oil, salt and pepper. Then place the potatoes in the roasting pan on top of the hay. Add the garlic to the roasting pan and place in the oven. Cook in the oven for 45 minutes until the potatoes are just done. Take out and let them cool to room temperature. Take the potatoes and peel them if desired. Slice them 1/8 inch thick, season them with salt and place back in the oven to get hot. Meanwhile take fresh truffle and slice them thin. Take four bowls and foam the fondue in the bottom of the bowl. Take the potato slices out and place a truffle slice in between each one. Place on top of of the potato fondue. Grate a little of the fresh horseradish on top of each potato. Finish the dish with mizuna, and truffle or olive oil around. Serve and enjoy!